In today's post, we will cross the Atlantic and take a look at the history of saltpeter and gunpowder trade in England. We know that gunpowder was most certainly known in Europe by the middle of the 13th century, brought to the west by the Mongols. The English monk, Roger Bacon, references gunpowder in his book published in 1267 AD and he witnessed at least one demonstration of Chinese firecrackers, probably brought by his friend, William of Rubruck, who had traveled to the Mongol empire. He even mentions it as a mixture of saltpeter, sulfur and charcoal. However, it was about 70 years since then that it was used for warfare in England. The European use of gunpowder in warfare really started with the Italians and Spaniards (via Arabs and the Mongol empire) and slowly spread north to France and England. The first time that gunpowder weapons were used in war in England was a French raid into the port town of Southampton in 1338. A fleet of French, Italian and Spanish sailors attacked the town and one of the weapons they brought was a ribauldequin, a multi-barrel cannon weapon. Drawing of two ribauldequins designed by Leonardo da Vinci. Click on the image to enlarge. Public domain image.. 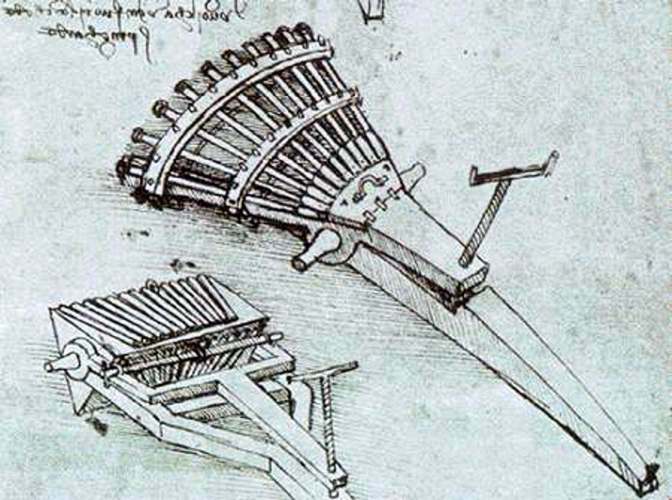 Note that da Vinci did not invent ribauldequins, as they were already in existence before he was born. Thanks go our to our reader Richard Sharpe, for his insightful comments below. It is recorded that the very next year (1339), Edward III of England obtained his own ribauldequins and used them against the French. They were also used by Edward III during the Battle of Crecy in 1346. While the battle is famous for the longbow becoming the dominant weapon in Europe for the next few decades, ribauldquins were used as well (though they didn't inflict many casualties at Crecy) and archaeologists are still finding cannon balls on the battlefield centuries later. Of course, it must be noted that at this time, England wasn't really manufacturing their own gunpowder, and they were largely buying supplies from Italians and Flemish merchants. During the War of the Roses in England, the battle of Bosworth in Leicestershire in 1485 AD saw both sides use gunpowder weapons. Henry VII, who won the battle, understood the value of firepower and brought in many foreigners who knew how to make gunpowder. While England made some saltpeter locally at this time, it was not enough to meet the needs of warfare. It is recorded that Henry VII authorized one James Hede in 1492 (the same year Columbus discovered America! ), to make saltpeter for the Royal Armory. Another document from 1501 mentions a Wyvard Godfrey as one of the king's makers of saltpeter. However, at this time, England's local production was not really that much at all. Henry VII's son, Henry VIII, developed England's firepower even more, buying practically every cannon he could lay his hands upon. His gunpowder supplies and supplies of raw saltpeter and sulfur came mainly from the Italian and the Baltic states (Hanseatic League). We have records of some of his suppliers: In November 1512, a Spanish merchant named Francis de Errona delivered 2906 pounds of raw saltpeter and 707 pounds of gunpowder, at the price of 4 pence per pound. It is recorded that Henry VIII went to war in France in 1513, carrying about 510 tons of gunpowder and his siege cannon used about 32 tons per day. Naturally, since he didn't have his own sources of saltpeter, he had to buy it from Southern Europe and the price of his supplies went up. In April 1514, a merchant named Leonardo Friscobaldi provided about 20 tons of saltpeter for a price of 6 pence per pound. The Cavalcanti family (especially Thomas and John Cavalcanti) from Florence, Italy, are also recorded as suppliers of saltpeter and gunpowder. Other suppliers include the Hanseatic merchants, Hans van Colen (also known as Hans Wolf) and Edmond Frende, as well as the Italians, Benedict Morovelli, Anthony of Naples and Frances de Bara. Soon after this, Henry VIII realized that it would be preferable for him to have his own source of saltpeter, otherwise his supplies could be disrupted by the French. Not only that, he and the French were buying their supplies from the same merchants, so they were often in competition with each other and the other European states as well! Therefore, he ordered the above mentioned German, Hans van Colen (alias Hans Wolf), 'to go from shire to shire to find a place where there is stuff to make saltpeter of'. As part of this order, he granted him permission to dig wherever he wished, as long as they compensated the owner accordingly. This was the rise of the saltpeter men in England. For about 30 years, the saltpeter production in England was by saltpeter men extracting it from natural sources (this type of saltpeter was called rock saltpeter). Then, in 1545, a German engineer named Stefan von Haschenperg told Henry VIII that he knew of a way to make saltpeter in one place, without going across the country to search for it. The technology for saltpeter plantations (nitre beds) was known to the various German states, but unknown in England at that time. Not much is known about von Haschenperg's experiments in England though, and if there was any success, it was on a very small scale, because Henry was still buying a lot of his supplies from Antwerp, Bremen, Hamburg and Lubeck. His next two successors, Edward VI and Mary Tudor, also bought their saltpeter and gunpowder from Antwerp (which was then under the control of the Spanish). In 1551, a spy working for the English secretary of state, William Cecil (later known as Baron Burleigh or Baron Burghley), informed him that several German states had developed techniques to produce their own saltpeter locally and they had plenty of supplies of it. In our next post, we will study the rise of saltpeter production under Queen Elizabeth I.
da Vinci was born in 1452, I believe ... so the drawings by da Vinci post-date the actual things if they were used in 1338. Yes, that's why the article does NOT claim that da Vinci invented ribauldequins. He did draw designs for ribauldequins, but there were already others in existence for many years before he was born. Good point though ... I'll add a note clarifying matters. Thanks much for your comments sir! No problems. It was a minor point. Can you contact me so we can discuss stuff about the Loshult gun and shooting Arrows from guns? Sounds like a plan. Please comment here with your e-mail address (I won't publish that comment, so no one else can see it and spam you :)).